Revenues shrink as a big Duke Energy smart grid project nears completion. What’s going to replace it? Smart grid networking company Ambient Corp. plans to lay off about a quarter of its staff and has lost its CFO as it scrambles to shore up flagging financial performance in the midst of uncertainty over the future of its work with marquee customer Duke Energy. The Newton, Mass.-based company on Monday reported a $3.5 million loss for the first quarter of 2013 on revenues of $5 million, compared to a loss of $188,000 on revenues of $13.3 million in the same quarter last year. The bad news comes on top of the company’s $5.4 million loss for fiscal year 2012 as reported in March, a flip from the company’s $10 million in profit for 2011. The company had $11 million in cash as of March 31, 2013, down from $13.3 million at the end of last year and $18 million as of Dec. 31, 2011. Ambient plans to reduce operating expenses by laying off employees and reducing executive compensation, according to Monday’s statement. The Boston Business Journal reported Friday that Ambient has laid off about 25 of its 106 employees, and that CFO Mark Fidler had left the company, according to a U.S. Securities and Exchange Commission filing. There’s no secret as to what’s driving Ambient’s worsening financial performance. “The decrease in total revenue year-over-year is attributable primarily to the near completion by the company's largest customer of its grid modernization project in Ohio,” the firm stated in its Monday report. That’s referring to Ambient’s project with Duke Energy, which will install nearly 100,000 of its multi-communications node devices in support of an 800,000-smart meter deployment in the Cincinnati area. Ambient also supplies nodes for Duke’s 3,000-home Charlotte, N.C. smart grid pilot project, and the utility accounted for a vast majority of the company's business as of last year. That’s put pressure on Ambient to expand its list of utility clients to sell more nodes and grow revenues. But so far, while it has announced various technology integration partnerships with cellular carriers like Vodafone and Verizon, and is testing its power quality monitoring technology in the U.K., it hasn’t announced any big new utility customer wins. 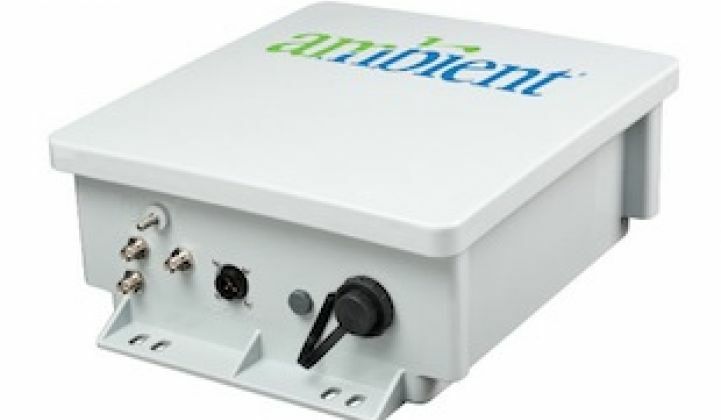 At the same time, Ambient appears to be staking a great deal of its future on Duke expanding its business with the company. In its March annual report, the company noted that Duke Energy would “potentially require hundreds of thousands of communications nodes” for full deployment in the utility’s Indiana, Kentucky and Carolinas service territories. The only problem is, Duke’s plans for those states are still in flux, both in terms of which technology vendors it will choose and whether or not it can get state regulators to let it do the work at all. In 2011, for example, Duke canceled a $14.5 million contract with Echelon for competing node devices to support a smart meter rollout after Indiana state regulators rejected the utility’s plans. But perhaps the biggest threat to Ambient’s plans with Duke comes from Cisco, which has been quietly working with Duke on smart grid networking for years now. Cisco has already deployed its grid routers and switches with Duke, and is working on smart meter and distribution grid networking with partners like Itron and Alstom, and customers like BC Hydro, in ways that could compete with Ambient’s idea of having its device sit at the intersection of multiple utility communications channels. Ambient got started in 2002 as a would-be provider of broadband-over-powerline technology. That market was also the target of companies like Current Group, before it became clear that utilities weren’t going to be able to compete with telcos and cable providers by using their powerlines as broadband pipes. Since then, Ambient has spent much of the past decade repositioning itself as a broader smart grid communications provider, and last year took its shares to Nasdaq from the pink sheets via a 100-to-1 reverse stock split.